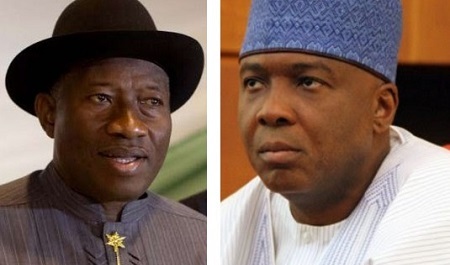 The Senate President, Dr. Bukola Saraki, said former President Goodluck Jonathan was never desperate for power, but got there by providence. He stated this on Thursday in Abuja at the unveiling of a book titled, “On a Platter of Gold: How Jonathan won and lost Nigeria,“ written by the National Publicity Secretary of the All Progressives Congress, Mallam Bolaji Abudullahi. “I think it is us Nigerians, that produce the kind of leaders we get; no matter what you say about Jonathan, I don’t think he was someone who was desperate for power,“ he said. Saraki added that it was unfortunate that Nigerians knew the right things to do, but would not do it but would keep playing the blame game. Saraki, who expressed optimism that the book would be cherished by Nigerians going by its quality, used the occasion to share two experiences he had with Jonathan. The Senate President said, “I like to share one or two things that will probably summarise the former President Jonathan. I remember when I was then a PDP senator and I came across this issue of fuel subsidy and the way the country was losing close to about N1.3tn. “In the history of this country, I don’t think of any singular kind of level of corruption as huge as that. I had a motion already that I wanted to present on the floor of the Senate. But I felt as a member of the ruling party at that time, it was only proper I discussed it with the President (first) maybe some action can be taken so that I can step down the motion. He added, “I booked an appointment to see Mr. President and I went with my paper. “I started with the background of how people brought in petroleum products. I said Mr. President, in the past, people use to get award letters from the NNPC to bring in PMS, DPK, and make 10, 20 per cent profit. I said sir, they’ve taken it to another level, now, and they get an order to bring in products and they don’t want to make 10 or 20 per cent any more. The Senate President said he was stunned. Saraki, however, conceded that that was the kind of person the then President was. While recalling the second encounter, Saraki said, “The second encounter I will recollect was the day I decided I am going to contest to be President. I felt that I didn’t want Jonathan to hear it as news. “I booked an appointment to see him. I went to the Villa and he said ‘come in, come in. how can I help you? I looked at the President of a third world country and said Mr. President I came to tell you that I am going to be contesting for your seat.